G7 is the only solution in the world to deliver work-anywhere wireless two-way voice communication, text messaging, gas detection, evacuation management and complete customization for every business. When trouble strikes, instantly mass-notify your teams of a hazard in the area. G7c is the world’s first 3G-connected gas detector with integrated lone worker monitoring and evacuation management tools, connecting workers to live monitoring personnel in real-time. Connectivity is complemented by an industrial two-way industrial speakerphone, text messaging and location tracking. Devices automatically watch over workers and call for help, even when the employee can’t. G7c delivers comprehensive gas coverage with an exclusive modular design, tailoring gas detection to every industry, application and scenario. Should a gas leak, fall or a no-motion incident be detected, assisted-GPS capability guide s responders directly to the effected worker’s location. G7c provides critical insights and situational awareness for optimized emergency responses, enabling teams to react with all the information necessary for rescues in complex, hazardous environments. Devices communicate all gas detection and safety incidents to live monitoring teams who can mobilize responders to an employee’s exact location or trigger evacuations in real-time when required. 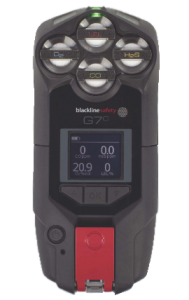 G7c with a standard cartridge functions as a connected personal safety and lone worker monitoring device, connecting workers to live monitoring personnel using 3G cellular networks. Connectivity is complemented by an industrial two-way speakerphone, text messaging and location tracking. Devices automatically watch over workers and call for help, even when the employee can’t. G7c provides critical insights and situational awareness for optimized emergency responses. Should a fall be detected or a no-motion incident sensed, assisted-GPS capability guides responders directly to the effected worker’s location. All safety incidents are communicated to Blackline’s live monitoring teams who can mobilize responders to an employee’s exact location or trigger scalable evacuations in real-time when required. rescues in complex, hazardous environments. Devices communicate all safety and gas detection incidents to Blackline’s live monitoring team, who instantly assesses the situation and mobilizes necessary responders to the employee’s exact location. G7c can trigger an evacuation in real-time, notifying and directing one worker or whole teams to designated muster points. G7c with a Quad-gas cartridge is a gas detector and lone worker safety device featuring 3G connectivity, delivering comprehensive gas detection coverage plus 24/7 live monitoring. G7c provides situational awareness, enabling teams to respond with all the information necessary for optimized rescues in hazardous environments. G7c with a Quad-gas cartridge is capable of monitoring up to four gases with a choice of sensor combinations tailored to complex working environments, including combustible gases, oxygen, carbon monoxide and hydrogen sulphide. Devices automatically connect workers with Blackline’s live monitoring teams in the event of an incident — should a worker call for help using their SOS latch, a gas leak or fall be detected. Devices communicate all safety and gas detection incidents to Blackline’s live monitoring team, who instantly assesses the situation and mobilizes necessary responders to the employee’s exact location. In the event of a widespread emergency, G7c can trigger an evacuation to pre-determined muster points in real-time. G7x is an industry-first connected gas detector with integrated lone worker monitoring and evacuation management tools, connecting workers to live monitoring personnel in real-time. With both 3G and satellite connectivity, G7x delivers true last-mile safety monitoring and gas detection alerting. Employees can work with confidence knowing their safety is being monitored in real-time by real people, in even the most remote locations. Devices automatically watch over workers and call for help, even when the employee can’t. Connectivity is complemented by two-way text messaging, providing critical insights on the brilliant LCD screen in the event of an emergency. G7x provides situational awareness enabling teams to respond with all the information necessary for optimized rescues in hazardous environments. Comprehensive gas coverage with an exclusive modular design tailors gas detection to every industry, application and scenario. Should a gas leak, fall or no-motion incident be detected, assisted-GPS capability guides responders directly to the effected worker’s location. All safety incidents are communicated to Blackline’s live monitoring teams who can mobilize responders to an employee’s exact location or trigger evacuations in real-time when required. G7x leverages G7 Bridge portable satellite and 3G base station, that switches seamlessly from cellular to satellite connectivity should cellular become unavailable. G7x communicates with G7 Bridge via an industrial-quality 900 MHz radio link from up to 2 km away. G7 Bridge communicates with the Blackline Safety Network and monitoring teams using 3G or satellite connections. G7x is a wires automatically watch over workers and call for help, even when the employee can’t. G7x provides situational awareness enabling teams to respond with all the information necessary for optimized rescues in hazardous environments. Should a fall be detected or a no-motion incident sensed, assisted-GPS capability guides responders directly to the effected worker’s location. All safety incidents are communicated to Blackline’s live monitoring teams who can mobilize responders to an employee’s exact location or trigger scalable evacuations in real-time when required. eless personal safety and lone worker monitoring device that connects workers to real monitoring personnel using 3G cellular and the Iridium satellite networks. Connectivity is complemented by two-way text messaging, providing critical insights on G7x’s brilliant LCD screen in the event of an emergency. G7x with a Single-gas cartridge is a wireless gas detector and personal safety monitoring device, utilizing 3G cellular and Iridium satellite networks to connect workers with live monitoring personnel. Devices automatically watch over workers and call for help, even when the employee can’t — should a gas leak, a fall or a no-motion be detected. With a Single-gas cartridge and a choice of gas sensor, G7x gas detection is customizable for specific working scenarios where multi gas coverage is not required. Available sensors include combustible gases, oxygen, carbon monoxide, and hydrogen sulphide. G7x provides critical insights and situational awareness, enabling teams to respond with all the information necessary for optimized rescues in hazardous environments. Devices communicate allsafety and gas detection incidents to Blackline’s live monitoring team, who instantly assesses the situation and mobilizes necessary responders to the employee’s exact location. G7x can trigger an evacuation in real-time, notifying and directing one worker or whole teams to designated muster points. G7x with a Quad-gas cartridge delivers comprehensive gas detection coverage plus 24/7 live monitoring. A connected gas detector and personal safety monitoring device, G7x features constant connectivity via 3G cellular and Iridium satellite networks. Devices automatically watch over workers and call for help, even when the employee can’t — should a gas leak, a fall or a no-motion incident be detected. 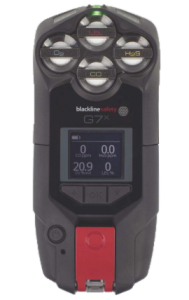 G7x with Quad-gas cartridge is capable of monitoring up to four gases with customizable sensor combinations tailored to specific working environments, including combustible gases, oxygen, carbon monoxide, and hydrogen sulphide. G7x provides critical insights and situational awareness, enabling teams to respond with all the information necessary for optimized rescues in complex, hazardous environments. Devices communicate all safety and gas detection incidents to Blackline’s live monitoring team, who instantly assesses the situation and mobilizes necessary responders to the employee’s exact location. In the event of a widespread emergency, G7x can trigger an evacuation to pre-determined muster points in real-time. Blackline Safety’s G7 Bridge is a portable base station that provides a satellite and cellular uplink for G7x devices, connecting employees to live monitoring personnel even in the most remote locations. G7 Bridge communicates with devices through an industrial-quality 900 MHz radio link. Connected employee-worn G7x devices work up to 2 km away from G7 Bridge. The transition to satellite communication is automatic when working beyond cellular networks, ensuring seamless monitoring coverage. G7 Bridge connects workers to monitoring personnel via two-way messaging and accounts for teams on a real-time map to best leverage available resources when help is needed. G7 Bridge is self-powered and portable, allowing it to be easily moved from one vehicle to another, such as from a truck to an all-terrain vehicle. The Blackline Safety G7 Dock is the simple solution to calibrating, bump testing and charging G7 devices. Docks arrive ready to perform, requiring no initial setup, and can manage up to four single- or multi-gas cylinders. Docks can be used with both G7c and G7x devices, and support G7 Single-gas or Quad-gas cartridges. Managing calibrations and bump tests is easy using the G7 device’s LCD screen and navigation system — no complicated menus, ports or setup. G7 Dock uses the cloud-hosted Blackline Live™ web portal for device management and to store data for reporting and compliance tracking — gas inlets can be configured through user accounts from a desktop or phone. The Blackline Live web portal is at the core of all G7 solutions, equipping businesses with leading safety monitoring tools, dashboard and comprehensive configuration management of fielded devices. Monitoring portal user accounts deliver everything needed to manage an emergency situation effectively — the safety status of every team member is visible, complete with custom emergency response protocols. Employee worn devices are easily configured for specific working environments, with G7 features such as gas detection limits and lone worker check-in intervals easily customized with a few clicks. G7 wirelessly communicates compliance and usage data for automatic reporting from Blackline Live, alleviating the need for manual data collection. Available on desktop and mobile, Blackline Live provides all the tools necessary to manage a world-class safety monitoring program. When GPS alone may be inaccurate or unavailable, Blackline’s Location Beacon broadcasts accurate positioning signals for simple and complex facilities. Beacons installed inside and around facilities transmit location signals for proximity detection with a Blackline safety monitoring device. Location Beacons provide a configurable power-level accommodating different positioning resolution needs. Beacons work in conjunction with custom floor and site plans, loaded into Blackline Live, mapping an employee’s location in the context of their surroundings.